Our world is experiencing a unique confluence of issues, innovations, and opportunities that is encouraging a hospitable academic atmosphere where geodesign can flourish as a platform for addressing the urgent environmental and community planning, conservation, and restoration needs of today and for the future. The emerging field of geodesign can be characterized as the collaboration of science and design that takes into account the interconnectedness between humans and nature. Geodesign is a deceptively simple formula that brings together knowledge—in the form of both data and human expertise—and infuses it with design creativity for the purpose of revealing and evaluating alternative futures for a place. Geodesign is and will be an important agent for cultural change. Education is taking up the call to address how geographic and spatial information can be combined with design to address some of the most complex challenges facing the environment, including human habitats, and, indeed, the future of environmental care. 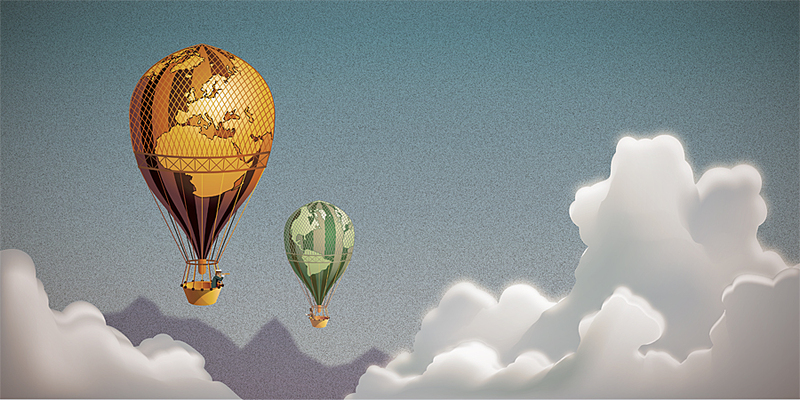 Geodesign education is taking flight, with several new programs and a few that will begin within the next year, and it is clear that these key concepts provide a foundation on which many of these programs have been or will be built. Additionally, many schools, mainly in landscape architecture or planning programs, offer geodesign classes, as well as classes not so named, that accomplish similar goals. Furthermore, it is highly likely that other programs are under development, and there are other signs of geodesign’s emerging impact on academia, such as recent university job openings with geodesign in the position description. Nevertheless, the intent of this article is to provide an overview of some universities with new degrees, certificates, and options that are specifically working to address these core curricular ideas and to help encourage ongoing dialog, worldwide, about geodesign education. Seven programs in the United States responded to a short survey, the results of which illustrate an interesting variety of ways that programs are emerging (see table below). These schools are Northern Arizona University, Penn State, Philadelphia University, the University of Arizona, the University of Georgia, the University of Southern California, and the University of Wisconsin (UW-Madison and UW-Stevens Point). Two, both of which are undergraduate programs, were part of larger university-level curricular revisions that sought efficiency by combining programs or encouraging interdisciplinary initiatives. These schools saw geodesign as an effective way to advance those goals while crafting a future-oriented program that brings together different disciplinary strengths from across the university. Two of the graduate programs decided to pursue geodesign due to the emerging trend and need for professionals who are knowledgeable about how to better integrate science with design. Three of the programs trace their roots to ideas and inspiration gained through attending the early Geodesign Summits. One evolved in response to a recent university strategic plan that outlined graduate education growth objectives. One hosted a geospatial summit that brought together educators and researchers from across the school system, which resulted in the new geodesign program. Four universities are offering only graduate-level programs; two, only undergraduate; and one university will address geodesign at both levels. Within the area of graduate education, there is diversity: two will offer master’s degrees; there will be two stand-alone graduate certificates, and two of the programs will offer geodesign as a focus area or option for graduate students. All but two of the seven are resident programs. Two have online components; one is offered entirely online; and the other will have courses online, as well as some collaborative, face-to-face experiences. Two of the programs rooted in landscape architecture schools slightly favor design. One housed in a department of geography, planning, and recreation slightly favors geospatial sciences, with only one course specifically focused on urban/community design. However, they feel that design is “scaffolded” throughout the curriculum, with a focus on design history in other classes, and students who take the Community Planning & Development emphasis will do a required conceptual design in a capstone course. Another promotes strengths in data inclusion and spatial modeling and therefore has a mix of approximately two-thirds science and one-third design. One has collaborative studios every semester. One offers a geodesign concentration where design applications are a culminating experience after other competencies have been developed. One incorporates design in the first year, followed by three architecture/design classes. 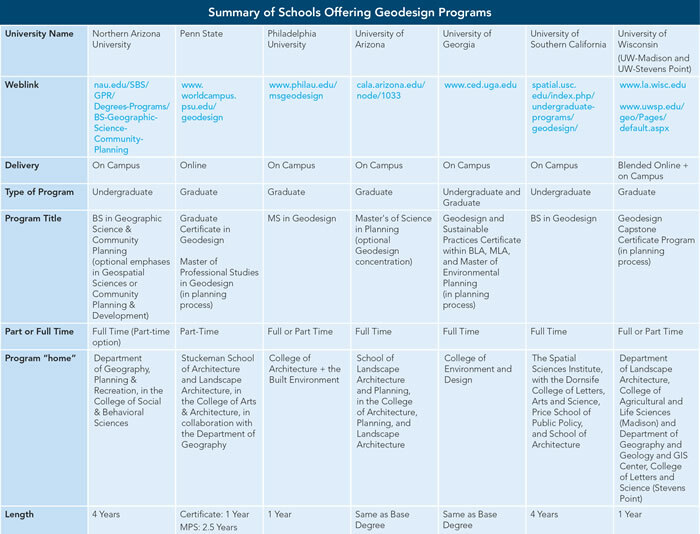 As discussed above regarding the likelihood that geodesign programs will develop their own specialties and emphases, the schools surveyed listed an interesting array of related courses that are either required or available as options to geodesign students. These include landscape ecology, communications and professional skills, public policy and regulation, professional and cultural values and ethics, quantitative sociology, heritage conservation, public participation and dispute resolution, building information modeling/CityEngine and other 3D visualization tools, sustainable design methods, and global issues (biodiversity, climate change, etc.). Of course, this article cannot be all-inclusive nor list all schools with new or developing geodesign programs either in the United States or internationally. Outside the United States (e.g., in China, Germany, Japan, Portugal, the Netherlands, and Thailand), there are numerous programs that adhere to the definition of geodesign education but may not use the term geodesign in the name. Some of these programs are housed within departments of landscape architecture, geography, urban ecology, engineering, and civil engineering. It will be interesting to track the evolution of new programs and degrees worldwide. Kelleann Foster, RLA, ASLA, is associate professor of landscape architecture; lead faculty for Geodesign Programs; and interim director, Stuckeman School of Architecture and Landscape Architecture, Penn State University. For more information, contact Kelleann Foster. Geodesign Programs: A map tour of U.S.-based university programs integrating design and geography. Take the tour.